For the South American language, see Quechua languages. The historic Yuman-speaking people in this region were skilled warriors and active traders, maintaining exchange networks with the Pima in southern Arizona and with peoples of the Pacific coast. The first significant contact of the Quechan with Europeans was with the Spanish explorer Juan Bautista de Anza and his party in the winter of 1774. Relations were friendly. On Anza's return from his second trip to Alta California in 1776, the chief of the tribe and three of his men journeyed to Mexico City to petition the Viceroy of New Spain for the establishment of a mission. The chief Palma and his three companions were baptized in Mexico City on February 13, 1777. Palma was given the Spanish baptismal name Salvador Carlos Antonio. Spanish settlement among the Quechan did not go smoothly; the tribe rebelled from July 17–19, 1781 and killed four priests and thirty soldiers. They also attacked and damaged the Spanish mission settlements of San Pedro y San Pablo de Bicuñer and Puerto de Purísima Concepción, killing many. The following year, the Spanish retaliated with military action against the tribe. After the United States annexed the territories after winning the Mexican–American War, it engaged in the Yuma War from 1850 to 1853. During which, the historic Fort Yuma was built across the Colorado River from the present day Yuma, Arizona. Estimates for the pre-contact populations of most native groups in California have varied substantially (see population of Native California). Alfred L. Kroeber (1925:883) put the 1770 population of the Quechan at 2,500. Jack D. Forbes (1965:341–343) compiled historical estimates and suggested that before they were first contacted, the Quechan had numbered 4,000 or a few more. 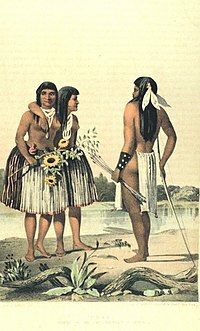 Kroeber estimated the population of the Quechan in 1910 as 750. By 1950, there were reported to be just under 1,000 Quechan living on the reservation and more than 1,100 off it (Forbes 1965:343). The 2000 census reported a resident population of 2,376 persons on the Fort Yuma Indian Reservation, only 56.8 percent of whom said they were of solely Native American heritage. More than 27 percent of these persons identified as white. The Quechan language is part of the Yuman language family. The Fort Yuma Indian Reservation is a part of the Quechan's traditional lands. Established in 1884, the reservation, at 32°47′N 114°39′W﻿ / ﻿32.783°N 114.650°W﻿ / 32.783; -114.650, has a land area of 178.197 km2 (68.802 sq mi) in southeastern Imperial County, California, and western Yuma County, Arizona, near the city of Yuma, Arizona. Both the county and city are named for the tribe. ^ Crowley, Steve. "Impacted Nations." Alyssia Hinton. Retrieved 1 June 2013. Forbes, Jack D. (1965). Warriors of the Colorado: The Yumas of the Quechan Nation and Their Neighbors. Norman: University of Oklahoma Press. Kroeber, A. L. (1925). Handbook of the Indians of California. Bureau of American Ethnology Bulletin. 78. Washington, DC. Zappia, Natale A. (2014). Traders and Raiders: The Indigenous World of the Colorado Basin, 1540-1859. Chapel Hill, NC: University of North Carolina Press. "Yuma Reservation, California/Arizona". United States Census Bureau. Wikimedia Commons has media related to Quechan. This page was last edited on 31 March 2019, at 20:17 (UTC).